The Chalker family, who recently stayed on Mumbo Island, recently put together a massive load of toys, clothes and gear to donate to Vision’s orphanage in Cape Maclear, which they had read about in our Guide to Mumbo booklet. Simon Chalker works in the courier business and organised to get the boxes flown to Lilongwe airport. Kayak Africa then delivered the boxes to Vision in Cape Maclear. 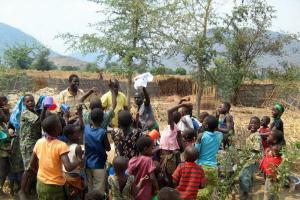 Vision runs an informal feeding scheme for vulnerable children in the village. His only sponsor is Kayak Africa who support him with monthly donations and by buying the vegetables which he and the children grow in their garden. The Chalker family’s donation of toys and clothes is a rare and wonderful opportunity for these children to receive new clothes and, for some of them, their first toy. Our Skipper Wins Lake Malawi International Sailing Marathon!